Jobsmart Tractor Supply air compressors are sold by Tractor Supply locations across North America.The Tractor Supply stores are branded as TSC, and there are more than 1700 outlets. Like many of the big box stores, Tractor Supply is a big distributor of tools and goods and big enough and sells enough product to warrant having products like air compressors built and private branded for them. Similar to many of the big box stores as well, spare repair parts for the Jobsmart compressor line are in short – or really – no supply, at least from Tractor Supply retail outlets. Their knowledge about air compressors in general is also sparse, though my experience is that folks working at the TSC stores may have a bit more working knowledge of air compressors than many of the store personnel at other larger, big box, compressor outlets, given that many seem to be farm raised and farm trained, and have hands on knowledge of compressors and how they work. If you have a service issue with your Jobsmart air compressor, the logical first step is to contact them. They have a contact page on their site for service questions. In order for them to help solve your Jobsmart compressor problem ensure that you have all the information about your air compressor available to fill in the on line form. At present you see that form by scrolling to the bottom of their website home page (http://www.tractorsupply.com), and clicking the Contact link under the SERVICE category. Next, appeal to the other users of Jobsmart compressors for help on this user page. 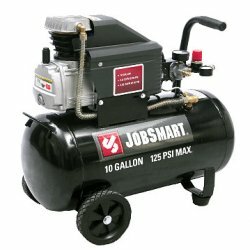 Are you an owner of a Jobsmart Tractor Supply air compressor? Do you have something good to say about your air compressor or, maybe, something negative to say about it? Have you noticed anything about your Jobsmart air compressor that would be useful for other owners of this air compressor to know? You are presently on my Jobsmart Tractor Supply air compressor page. Here you can read questions and answers about other Jobsmart air compressor owners, learn about others experiences, maybe find some tips for using your air compressor. It is also where you can help another Jobsmart air compressor user if you are so inclined. Here is one Jobsmart TSC manual that a kind person emailed to me for posting on this site. Feel free to download them for your use. Don’t forget to save them to your computer. If you have any of their manuals in digital format you can upload them here for others to share.